This web site header and subsequent pages leads the reader through the deception, the altered evidence and fraud of the events in Dallas. The novel 1963 has sourced salient facts of the JFK Assassination. One only needs to know the basics of the plot to understand how the government had lied to the American people for fifty-three years. The reader is encouraged to dig deeper and discover more evidence of conspiracy. More importantly, spread the truth, it’s the only way to bring justice for President Kennedy. This novel is not a chronology of the JFK Assassination nor is it meant for researchers in possession of minute details of the JFK events. It is for those who have no knowledge of the murder of President Kennedy. What this novel professes is a connection of documented events that can serve as a gateway to study the work of researchers. Subsequent editions of 1963 will reflect the newly released documents and awareness of what has been hidden from the American people and the world. If I have overlooked or discounted pertinent facts I will stand corrected. Let us connect the dots. 1963 is an unusual science fiction-time travel novel that collides with the real Lee Oswald and his activities preceding the assassination of President John F. Kennedy. It is my hope that this novel will be a gateway to all aspects of the complex scenario that produced the death of President Kennedy. This digital version contains online links and graphic images for the reader to better understand the background and perspective of this complex story. Rather than rely on official stories and character destruction, 1963 refers to validated events. I am not a researcher. This footnoted work is written on the shoulders of countless investigators, who year after year searched for the truth in the face of relentless criticism, humiliation, and the weight of government obfuscation. This book is not intended for those who experienced the horrific events in Dallas in November 1963. Nor is it an encyclopedia. The weaving together of the conspiracy is presented to those not yet born when Kennedy died. Contained within is a simple connecting of pertinent facts in the latter part of 1963. The truth remains alive because witnesses made the courageous choices, as President Kennedy would have admired, to speak up in the face of threat, danger, and loss of position. Like President Kennedy, dozens of these men and women were murdered. As a time travel author, I am in awe of how history became remarkably altered by the murderers and those complicit in aiding, abetting, and fomenting the plot on President Kennedy’s life. Subsequently, the dogged, pervasive, and mostly ruthless cover-up effort persists over half a century later. The United States was founded as a republic with representative government. Lincoln so eloquently stated that this nation, under God, shall have a new birth of freedom and that government of the people, by the people, for the people shall not perish from the earth. To capture these ideals, this nation needs the truth of just how that government derailed and failed to be a government of the people in 1963. Only then, will we have another new birth of freedom and establish justice for President Kennedy. This online edition is illustrated. Links to films, documentaries and biographies of the Kennedy Assassination players not only buttress the major assertions of this novel, but provide the reader with an expansive resource to understand why the Thirty-Fifth president of the United States was murdered. It is not my intent to inject what some may consider phantasmal science fiction into what is a serious study by devoted and competent researchers. For those who are not inclined to read the science fiction aspects of 1963 or the novel itself, the digital edition of 1963 has “Easy Access.” The political and historical aspects of the Kennedy Assassination can be effortlessly summoned with a single click. Rewriting history carries an expensive price tag. For years, Patch Kincaid had relived John Kennedy’s assassination behind a foldaway aluminum table in Dealey Plaza, Dallas, Texas. The locals knew him as the eccentric bearded fool who once claimed he caused Kennedy’s death in 1963. Little kids would then add up the years from 1963 to 2013 on their fingers. Then, inevitably, someone would proclaim him a liar. How could somebody in his forties have been alive fifty years ago? If only he could prevent Kennedy’s death. Nobody cared now about what happened half a century past on the street below. Patch did not involve himself in conspiracy theories or what-ifs about JFK. Across his tabletop were the books and DVDs celebrating the career of John F. Kennedy. At times, he would play some of Kennedy’s speeches through his docked MP3 player into the humongous gray boom box below the table. Just last week, three Dallas police officers had threatened to have him arrested as JFK’s voice, teaming with optimism, told the world why the United States chose to go to the moon. During the last few days, the unusually cold temperatures had prompted him to close down his table and take a break on the front steps of the museum. 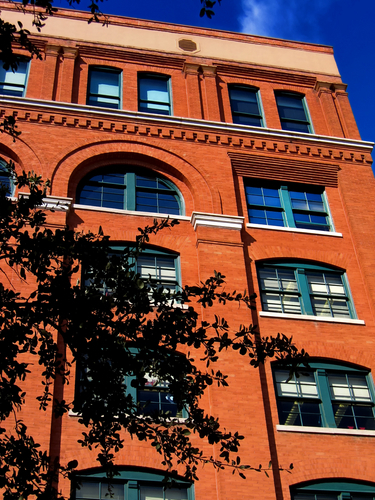 He gazed up at the sandstone brick building, once called the Texas School Book Depository Building, where the loner Lee Harvey Oswald shot Kennedy from the corner sixth-floor window on November 22, 1963. [i] On the day of the assassination, a huge yellow Hertz Rent a Car sign on the roof displayed the time in white digits. [ii] Patch had no reason to question what Earl Warren and his distinguished commission members had written in twenty-six volumes so many years ago. In his old timeline, he remembered Kennedy being alive in 1986. He understood he had warped history’s fabric because he traveled back in time to 1961 and returned to 2003. The traffic ebbed and flowed in a fluctuating buzz along Elm Street. From the museum’s stone steps, he checked the triple underpass ahead and the stockade fence to his right atop the knoll, and then he panned down Houston Street to his left. Over the past few weeks, he had seen men watching him from numerous locations. Two intelligence operatives had warned him three months ago to mind his own business and leave Dallas permanently. Even his friend Herman grew nervous. Herman’s straggly steel hair and deep-set spooky brown eyes gave him the look of a madman. In his denim jacket, he led a group of young students in the cold air toward the museum. Patch smiled as Herman recited in a gritty voice from memory the words on the plaque outside the building. “ Formerly the Texas School Book Depository. The site was originally owned by John Neely Bryan, the founder of Dallas. During the 1880’s French native Maxime Guillot operated a wagon shop here. In 1884 the land was purchased by Phil L. Mitchell, President and director Rock Island Plow Company of Illinois. An office building for the firm’s Texas division, known as the Southern Rock Plow Company was completed here four years later. In 1901 the five-story structure was destroyed by fire. That same year, under the supervision of the company vice president and general manager F.B. Jones, work was completed on this structure, built to resemble an earlier edifice. It features characteristics of the commercial Romanesque revival style. “In 1937 the Carraway Byrd Corporation purchased the property. Later, under the direction of D.H. Byrd the building was leased to a variety of businesses, including the Texas School Book Depository. Herman brought the group around the corner on Houston Street near the traffic light. The next caravan of cars and a couple of small trucks moved away from the light. Patch squinted, and his eyes watered as he faced the oncoming gust. Not many people were in the plaza today. Random snow pellets accompanied the northern air and low-hanging gray clouds, and transformed the plaza into a chilled mausoleum. He pushed his thumb on the highlight screen to June 1963 and Kennedy’s Berlin Speech -the president’s most inspiring speech. JFK’s voice broke through time from 1963. He mouthed the words. A pudgy young man and his bleached blonde wife looked up the knoll at Patch. The man zipped up his blue Chicago Bears Jacket. Patch stroked his beard. At least he had gotten their attention. Mr. Chicago pointed at the concrete pedestal where Abraham Zapruder had filmed the assassination with an 8 mm Bell & Howell, model 414PD Director Series camera, operated by a spring mechanism. Then they climbed toward Patch. “Hey, how come Kennedy flew backward… if he was shot from behind?” asked Mr. Chicago in a gruff voice. His dark beard bristles blanketed his rounded chin, and the remnants of whatever he drank for lunch lingered in the air. “That’s great, but the CIA had JFK knocked off,” said Mr. Chicago, pretending his finger was a gun. “Isn’t it more important that we understand what he accomplished?” asked Patch. “We saw that at the Kennedy Library up in Boston,” said the lady. “He’s still dead either way,” replied Patch. Mr. Chicago just kept walking as Delores shrugged her shoulders. Then he performed an odd alignment with his thumbs and forefingers from behind the fence. Patch had seen the machinations before. People always emerged from the fence, proclaiming the easy shot to the street below. along the grass toward Patch’s table. A scented perfume accompanied her approach. She had a genuine smile and chestnut eyes, and her smooth voice indicated kindness and sensitivity. “Like you?” she asked, followed by a quick laugh. She looked over her shoulder toward the sixth-floor window. “Who said that?” asked Patch. “We used to say it’s rattling my cage,” she said patting his shoulder. Patch pinched the brim of his Aussie hat and zipped his faded army jacket. It was too damned cold to be selling anything out here today. He squinted into the January glare across the triple underpass toward the Stemmons Freeway. With a single jab, he pushed the Mp3 button for the Kennedy Berlin speech. Her head darted to the left, and she smiled. She clutched onto Patch’s extended arm, and they took short steps down the cold Elm Street sidewalk. Her face assumed a new excitement with the president’s words in the background, and her soft scent followed them toward the street. With just Kennedy’s speech breaking the lonely silence in Dealey Plaza, their conversation disappeared. Her glassy eyes gravitated away from the asphalt X and toward the railroad bridge’s weathered concrete. The cloud-smeared sun cast a dreamy glow over their shadows on the sidewalk under the lofty Reunion Tower overlooking the plaza. A few more people snooped around the stockade fence atop the knoll. He looked over his shoulder to the central pergola where Zapruder’s secretary had steadied him on the concrete riser. Zapruder had panned his movie camera toward the motorcade as it proceeded slowly down Elm Street. [ix] Patch winced when he visualized Kennedy’s head blowing apart on that sunny November day in 1963. He had only viewed the film once, and that was enough. They shuffled onto Elm Street’s smooth pavement. She remained remarkably composed when they reached the spot where the fatal shot had hit Kennedy. Her little nose and wide cheeks formed a firm facade, but her dark eyes were fixed to the pavement. She shook her head and looked up at him. Patch tilted his head. She released his arm and smiled. Then she checked the road and walked with her head up toward the open grass stretch back toward Main Street. Like a solider parading across a battlefield, she passed under the rippling American flag above the pergola along Houston Street. Then she entered the crosswalk and was gone. Patch eyed the sandstone facade’s sixth-floor window. When he worked at the museum, his job involved steering patrons over to the Plexiglas cubicle surrounding the stack of cardboard boxes that partially obscured the infamous window. The army psychiatrists had advised his friends that his working in the museum would help him shed the responsibility for Kennedy’s death after traveling back in time. Yet he remained confused as to how his association with the Bay of Pigs Invasion in 1961, the Cuban rebels, and, specifically, Carlos Sánchez’s death had prompted a lone gunman to shoot the president. He focused on the building’s concrete-framed entry, and then he peered through the twisted oak branches along the quiet side street that led toward the knoll and a parking area adjacent to the rail yard. Every time a train passed, the rumbling cars and the lonesome whistle hearkened him back fifty years. The conspiracy buffs had men shooting from catch basins, others aiming guns from cars in the motorcade, some firing darts from an umbrella, and even snipers targeting Kennedy from surrounding buildings. And they assigned blame to every possible person or group. Now he was condemned, like the Ancient Mariner in Coleridge’s epic poem, to impart aspects of JFK’s life to those who would listen. A new history now existed since his time travel journey. Ray Meinkewitz, who had formulated time travel theories into a working embarking chamber, had long since retired in Florida. Meinkewitz would never receive the recognition for pioneering the time dilation experiments. The government had locked it all away in a National Archives warehouse in New Mexico. Kate retrograded from 1961 before Patch returned to the future from the dam in Cuba. He and Kate had planned to marry, yet they lied to Kate and said he had died. She married someone else. From a distance, he had seen her family years ago. Now his life felt as if he were floating in a comfortable limbo. He waved at Herman. His drifter friend, a Dealey Plaza tourist guide, had made five hundred bucks off a group of tourists last summer. Herman, like the lady who had just disappeared beyond the crosswalk on Houston Street, did not think Oswald killed Kennedy. Patch did not want to listen to yet another conspiracy theory. From the corner of Houston and Elm at the traffic light, his lanky buddy, clad in a denim jacket, returned the wave. Near the stockade fence, a mustached man in his thirties, clad in a dark sports coat and white turtleneck, walked briskly from the parking lot behind the knoll. Patch had seen this man spying on him last week and he now watched him closely. The man continued up the hill to the concrete triple underpass. On November 22, 1963, railway workers awaited the arrival of the president and Mrs. Kennedy along those railroad tracks. On that Friday, both sides of the road below were lined with people. The mustached man caught up with him as he leaned on the concrete bridge abutment. He walked ahead of Nick back to his table near the curved pavilion. Patch’s eyes intensified as a burst of cold air arose like a ghost from Elm Street. He motioned Nick around the back of the pavilion. The red sandstone face of the museum loomed overhead. To his left, the parking lot opened behind the stockade fence. He walked silently back to his table. Kennedy’s speech had ended. Traffic accelerated past the green light and flowed freely over the roadway. He gathered up his CDs and books and placed them carefully into the plastic crates he had removed from under the table. Even in the cloudy weather, Nick’s shadow shaded the table. His square shoulders and large frame formed a blackened behemoth against the fuzzy clouds. Many times, Patch had tried to envision the world as it once existed with Kennedy alive in 1986. [i] The Warren Commission Report, Chapter One, Summary and Conclusions, pp. 18. [ii] The Search for Lee Harvey Oswald, Robert J. Groden, Penguin Studio Books: New York, pp. 101. [iii] Formerly the Texas School Book Depository Building, Marker #: 5113006895, 411 Elm Street, Dallas, Texas, Dedicated 1980. [iv] Enemy of the Truth, Myths, Forensics, and the Kennedy Assassination, Sherry P. Fiester, JFK Lancer Productions: Southlake, TX, 2012, pp. 223-4. [v] John F. Kennedy Presidential Library and Museum, John F. Kennedy, Remarks at the Rudolph Wilde Platz, Berlin, June 26, 1963. [vii] Rush to Judgment, Mark Lane, Holt, Rinehart, and Winston, New York, 1966, pp. 36–8. [viii] John F. Kennedy Presidential Library and Museum, John F. Kennedy, Remarks at the Rudolph Wilde Platz, Berlin, June 26, 1963. [ix] Rush to Judgment, Mark Lane, Holt, Rinehart, and Winston, New York, 1966, pp. 41. In 1986, led by terrorist Carlos Sanchez, nuclear devices are planted in American cities. As New York and other cities are swallowed up in fireballs, Patch Kincaid is sent back in time to prevent the destruction. He lands in 1961, where he chases Sanchez into the Bay of Pigs Invasion. Captured by Castro, Patch and his mentor, Meinkewitz track Carlos into rural Cuba. Patch's actions result in President John F. Kennedy's assassination.